There are a million heroic military stories, and they all deserve to be told. Thanks to author David Lawlor for this post. The movie Saving Private Ryan was much feted when it was first released for its realistic depiction of the sheer terror experienced by those who took part in the D-Day landings on Normandy’s ‘Omaha Beach’. The plot – which centres around the bid to find Pvt Ryan, the sole survivor of four siblings who went to war, and to bring him to safety – mirrors actual events. 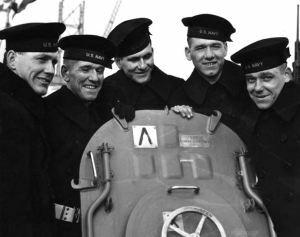 The Sullivans on board the USS Juneau (left to right) Joseph, Francis, Albert, Madison and George. At a time when men, women and children were being blown to pieces in the Second World War, there was one tragedy, which occurred in 1942, that gave even the most battle-scarred soldiers and citizens to pause and give thanks that they had been spared such pain.